And still it is called "Football" ??? Of course "Footovoid" would sound a bit strange - wouldn't it. ... guess that's all they could come up with since "handball" was already taken. That said, they could have used the Rugby method, and stamp the name of the place where that thing was created, on the game itself. Oh.. and I also heard the corn lobby was upset over a Budweiser commercial advertising for a corn syrup free beer..... the nerve trying to introduce a beverage that does not contribute one iota to the well being of the diabetes epidemic! In beer it's used as a fermentable sugar and thus DOES contribute to alcohol content, but the negative side is it reduces the amount of ethanol available to pollute, er, dilute, gasoline. Hey I'm tryin' real hard to keep a straight face here so don't tip my balance, ok? "And yet, brewing ferments sugars into alcohol anyway — meaning most light beers end up with little-to-no sugar regardless of what kind of fermentables you put in them. So to imply that corn syrup is somehow worse for you by tacitly tying it into the criticism around high fructose corn syrup as an unhealthy sweetener is entirely misleading." Note there's only 2 grains listed on that label, in an era when all others listed "Select grains" because they didn't wanna cop to using rice. 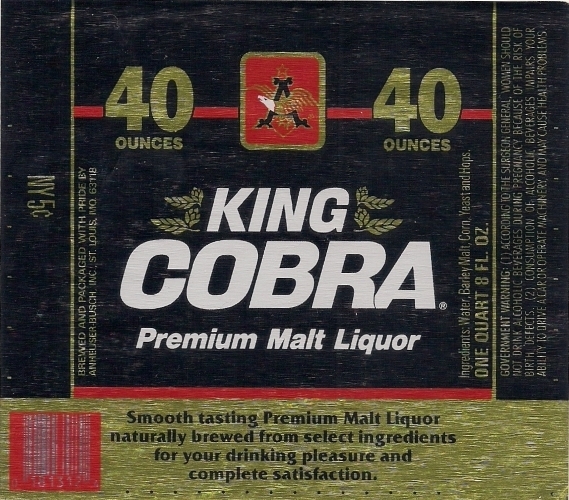 Sad to say, since then even Cobra has gone to the "selected grains" label; enabling the use of rye and even sorghum. Last edited by adorshki; 02-05-2019 at 12:46 AM. Not a question of economics, richardp, a question of priorities. But you're right, I wouldn't turn down the money. For years craft beer brewers have used ingredients as a way to distinguish between their product and mass produced beers. Their audience is aware of the Reinheitsgebot and it is often viewed as a higher standard, even if the purity laws are are not observed by all brewers all the time. Corn is not an "allowed" ingredient. Coca Cola has been under fire for using high fructose corn syrup, instead of sugar, in its U.S. products. Mexican Coca Cola (as distinct from Mexican coke) commands a premium when it is available in the U.S. because it uses sugar. In that context this ad taps into a general perception that, in some cases, corn syrup is "bad" in beverages. It also taps into the craft beer focus on ingredients. It distinguishes Budweiser from its competitors for the consumers who care about these things and one can imagine Budweiser declaring success if a someone who would normally order a craft beer finds none available and orders a Bud (instead of a competitor or just switches to water). Given that all the megabrewers are losing sales to craft beers this could be one way to stem that tide. Big corn certainly has something to react to but in the context of Bud vs. craft beers, it seems that corn is not the target, just collateral damage, in a marketing war that has been going on for several years. "On Thursday, Anheuser-Busch posted the ingredient list for Budweiser and Bud Light on its website. Budweiser and Bud Light beer is made from water, barley malt, rice, yeast and hops, according to www.tapintoyourbeer.com, which is run by Anheuser-Busch, TIME notes." In the Art of War , Sun Tzu would have called this a diversionary tactic. Last edited by adorshki; 02-04-2019 at 11:45 PM.